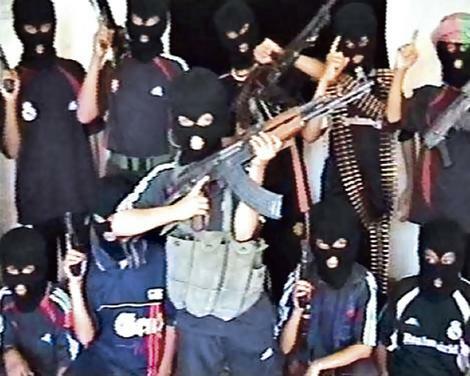 Al-Qaeda’s longstanding use of children to wage jihad was on display in a recent video showing boys as young as five training with assault rifles and handguns at a terrorist training camp. The video of the gun-toting, prepubescent jihadists was reportedly filmed by the al-Qaeda-linked East Turkistan Islamic Movement (ETIM) at one of the terror group’s training camps in Pakistan’s North Waziristan region. Since 1990 the ETIM, which has been fighting to create an independent Islamic state in China’s northwestern Xinjiang region, has not only committed more than 200 acts of worldwide terrorism but has trained scores of jihadists to fight alongside al-Qaeda and the Taliban. Like father like son, many of the young boys in the ETIM camp were reportedly orphans of slain al-Qaeda fighters coerced by their malevolent elders into carrying on their families’ jihadi business. It should be noted that the use of child combatants is a worldwide plague practiced by a wide array of government, militant, insurgent and terrorist forces. In fact, it is estimated that most of the 300,000 boys and girls involved in the over 30 ongoing conflicts worldwide are less than 15 years of age. Most of these child soldiers are either forcibly recruited — abducted at school, on the streets or at home — or have joined “voluntarily,” driven to enlist by a need to escape crushing poverty. While some end up in government armed forces and civil militia, most find themselves serving in nongovernmental forces, such as terrorist and insurgent groups, with their combatant roles relegated to such activities as armed fighters, messengers, domestic workers and sexual slaves. Yet, not surprisingly, al-Qaeda, the Taliban and its Islamist allies have taken their use of child combatants to a completely new and ruthless level, disregard that finds its expression in forced indoctrination and training that includes, among other things, using children as suicide bombers. For example, al-Qaeda and the Taliban have constructed and operated a slew of suicide training facilities in Afghanistan and Pakistan, death factories that have trained over 5,000 Pakistani children, many as young as eight, as suicide bombers. For those who chafe at the idea of self-slaughter, the terrorists rely on the threat and use of violence to ensure compliance. Not surprisingly, the need to resort to violence to guarantee obedience comes from the fact that many child recruits don’t come to the jihad willingly, but are the victims of kidnapping by the terrorists. That type of forced coercion has been disturbingly demonstrated by al-Shabab, Somalia’s notorious al-Qaeda-linked terror group that has gained a well deserved reputation for brutality in its efforts to remake Somalia into a Sharia-run Islamist state. Of course, al-Shabab has found other creative uses for its underage recruits, some of whom are as young as seven years of age. After spending up to three months learning how to use heavy weaponry, including AK-47s and rocket-propelled grenades, graduates are sent to the frontline to serve as human shields to protect adult fighters. Like most Islamist terror groups, al-Shabab either abducts its child recruits from their homes and schools or entices them by offers of free food and gifts. In some cases, however, the Islamists take advantage of a child’s grinding poverty by paying for his services. In northern Mali, for example, Ansar Dine, the Movement for Unity and Jihad in West Africa, and al-Qaeda in the Islamic Maghreb have paid over 1,000 children up to $30 a day and $400 a month to join their forces. The use of child combatants is also gaining in popularity in Syria where a report by the UN Independent International Commission of Inquiry found the rebel Free Syrian Army, laden with Islamist and al-Qaeda-linked terror organizations, forcibly recruiting children, some as young as eight-years-old, into their ranks. Yet, as horrific as life is for a child ensconced inside the ranks of an Islamist terror outfit, children outside their deadly confines can still find themselves unsuspectingly used for lethal operations. In one such particular case in July 2012, members of al-Qaeda in Yemen asked a 12-year-old boy to deliver a packaged gift to his father, a tribal sheik who was an outspoken opponent of the terrorist group. When the boy entered his house, he was killed instantly when the package exploded. Sadly, the appetite by Islamist terror groups for child soldiers doesn’t appear to be satiating anytime soon given the favorable cost-benefit ratio their use entails. Unfortunately for these children, the gruesome reality of their violent deaths will most definitely trump the empty promise of the jihadist paradise painted by their heinous guardians.